The reason why we spend so much time caring for our teeth and maintaining them is because we don’t want you to lose your teeth. Periodontal disease can not be cured, only maintained. To prevent this from happening, we can’t just take care of our teeth – we need to take care of the gums and the tooth-supporting bone as well. These surrounding structures can be vulnerable to being attacked by bacteria that causes gingivitis. If gingivitis progresses to a more advanced stage, bone and attachment loss can occur; this is called periodontal disease. Periodontal disease can cause your teeth to be lost. As your periodontal therapy experts and cosmetic dentist in Charleston, WV, we’re here to offer periodontal therapy to make sure that you keep your teeth for as long as possible. Periodontal therapy is used to restore diseased gum tissues back to health. Periodontal disease is capable of spreading from the gums to the bone that support the teeth. This can end up causing tooth loss in severe cases. Thankfully, periodontal therapy is able to help slow the progression of the disease. Scaling and Root Planing – These are deep cleaning techniques that are the best way to start the prevention of gum disease. Using hand scalers and ultrasonic instruments will help remove plaque and tartar from beneath the gum tissue. Periodontal Maintenance - Periodontal maintenance is routinely performed every 3 months following scaling and root planing or surgical periodontal therapy with a periodontist. If you require one of the following procedures, our office will be happy to refer you to one of a periodontist in our area. Gum Grafting< – If your tooth roots are exposed, the utilization of gum grafting will be vital in order to protect your roots. We’ll take gum tissue from one area of your mouth and move it to the part where it’s needed. Alternatively, we can use laboratory-processed donor tissue as well. Periodontal Plastic Surgery – This reshaping procedure will create a much more pleasant appearance of the gum tissue. 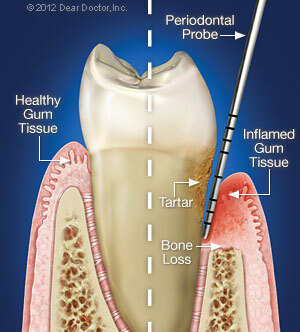 Periodontal Laser Treatment – Our periodontal laser treatment can remove any of your diseased gum tissue. This provides many advantages over conventional surgery, including less gum shrinkage and less discomfort for the patient. Crown Lengthening Surgery – This is a surgical procedure that’s performed when a tooth structure is actually covered by too much gum and bone tissue. This surgery will expose the tooth more, which is done for cosmetic reasons, such as making a smile look less ‘gummy,’ or to help secure a dental crown. Dental Implants – If you end up losing a tooth, this is the most effective and long-lasting replacement. Titanium dental implants will be inserted beneath the gum line and into the jawbone with a minor surgical procedure. After that, a realistic-looking dental crown will be attached to the implant. The main cause of periodontal disease is plaque, which is why it’s crucial for you to remove it daily through proper brushing and flossing. Make sure that you don’t scrub your teeth; this can actually cause your gums to recede. It’s also important for you to make regular visits to the dentist’s office. There are some areas of the mouth that a toothbrush and floss aren’t capable of reaching, which is why you need to get a professional cleaning from your dentist. This dental exam can also be helpful in detecting any early signs of gum disease before it becomes noticeable. Additionally, you’ll want to eat a nutritious diet that’s low in sugar. Make sure to stay away from all types of tobacco as well. Following these guidelines will help improve your periodontal health and help you keep your teeth for your entire life. Contact Your Cosmetic Dentist in Charleston, WV Today! If you’re in need of Charleston periodontal therapy or you’re looking for a periodontal dentist, please feel free to give us a call at (304) 343-9131. Alternatively, you can fill out our online appointment request form. We hope to help you keep your teeth for a lifetime of healthy smiles!